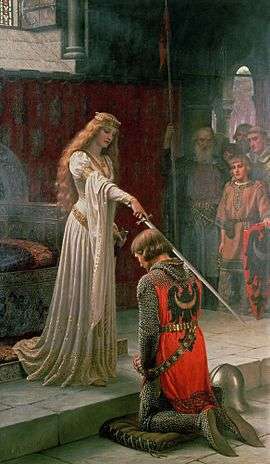 The Accolade by British painter Edmund Blair Leighton exhibits an idealized view of history common in historical fantasy. Historical fantasy is a category of fantasy and genre of historical fiction that incorporates fantastic elements (such as magic) into the narrative. There is much crossover with other subgenres of fantasy; those classes as Arthurian, Celtic, or Dark Ages could just as easily be placed in Historical Fantasy. Stories fitting this classification generally take place prior to the 20th century. Films of this genre may have plots set in biblical or classical antiquity, often with plots based very loosely on mythology or legends of Greek-Roman history, or the surrounding cultures of the same era. The story takes place in a secondary world with specific and recognizable parallels to a known place (or places) and a definite historical period, rather than taking the geographic and historical "mix and match" favoured by other works of secondary world fantasy. However, many if not most, works by fantasy authors derive ideas and inspiration from real events, making the borders of this approach unclear. All four approaches have overlapped with the subgenre of steampunk commonly associated with science fiction literature. However, not all steampunk fantasy belongs to the historical fantasy subgenre. After Antoine Galland's translation of One Thousand and One Nights became enormously popular in Europe, many writers wrote fantasy based on Galland's romantic image of the Middle East and North Africa. Early examples included the satirical tales of Anthony Hamilton, and Zadig by Voltaire. English-language work in the Arabian fantasy genre includes Rasselas (1759) by Samuel Johnson, Tales of the Genii by James Ridley (1764), Vathek by William Thomas Beckford (1786), George Meredith's The Shaving of Shagpat (1856), Khaled (1891) by F. Marion Crawford, and James Elroy Flecker's Hassan (1922). In the late 1970s, interest in the subgenre revived with Hasan (1977) by Piers Anthony. This was followed by several other novels reworking Arabian legend: the metafictional The Arabian Nightmare (1983) by Robert Irwin, A Noose of Light (1986) by Seamus Cullen, Diana Wynne Jones' children's novel Castle in the Air (1990), Tom Holt's humorous Djinn Rummy (1995) and Hilari Bell's Fall of a Kingdom. Celtic fantasy has links to historical fantasy and Celtic historical fiction. Celtic historical fantasy includes such works as Katharine Kerr's Deverry series, or Teresa Edgerton's Green Lion trilogy. These works are (loosely) based on Ancient Celtic cultures. The separate folklore of Ireland, Wales, and Scotland has sometimes been used indiscriminately, sometimes with great effect,as in Paul Hazel's Finnbranch trilogy, Yearwood (1980), Undersea, (1982) and Winterking (1985); other writers have distinguished to use a single source. Scottish Celtic fantasy is less common, but James Hogg, John Francis Campbell's The Celtic Dragon Myth, published (1911), Fiona MacLeod (William Sharp), George Mackay Brown and Deborah Turner Harris all wrote material based on Scottish myths and legends. Fantasy based on the Breton folklore branch of Celtic mythology does not often appear in the English language. However, several noted writers have utilized such material; Robert W. Chambers' The Demoiselle d'Ys (from The King in Yellow,1895) and A. Merritt in Creep,Shadow! (1934) both drew on the Breton legend of the lost city of Ys, while "The Lay of Aotrou and Itroun" (1930) by J. R. R. Tolkien is a narrative poem based on the Breton legend of the "Corrigan". For more details on this topic, see Wuxia. Wǔxiá (Traditional Chinese: 武俠, Simplified Chinese: 武侠, Mandarin [ùɕjǎ], Cantonese Pinyin: mów hàb), literally meaning "martial (arts) heroes", is a subgenre of the quasi-fantasy and martial arts genre in literature, television and cinema. Wǔxiá figures prominently in the popular culture of Chinese-speaking areas, and the most important writers have devoted followings. Classical Fantasy is a subgenre fantasy based on the Greek and Roman myths. Symbolism from classical mythology is enormously influential on Western culture, but it was not until the nineteenth century that it was used in the context of literary fantasy. Richard Garnett (The Twilight of the Gods and Other Tales, 1888, revised 1903) and John Kendrick Bangs (Olympian Nights, 1902) used the Greek myths for satirical purposes. Twentieth century writers who made extensive use of the subgenre included John Erksine, who continued the satirical tradition of Classical Fantasy in such works as The Private Life of Helen of Troy (1925), and Venus, the Lonely Goddess (1949). Eden Phillpotts used Greek myths to make philosophical points in such fantasies as Pan and the Twins (1922) and Circe's Island (1925). Jack Williamson's The Reign of Wizardry (Unknown Worlds, 1940) is an adventure story based on the legend of Theseus. Several of Thomas Burnett Swann's novels draw on Greek and Roman myth, including Day of the Minotaur (1966). The Firebrand (1986) by Marion Zimmer Bradley and Olympic Games (2004) by Leslie What are both Classical fantasy tales with feminist undertones. Fantasy Steampunk is another subgenre of historical fantasy, generally set in the Victorian or Edwardian eras. Steam technology, mixed with Victorian- or Gothic-style architecture and technology, is the most widely recognized interpretation of this genre. One of the most popular characteristics of steampunk is the appearance of naked clockwork and rusty gears. Some works in this genre are alternate history. Similar to Steampunk, Gunpowder Fantasy is considered a step below its more popular cousin. Gunpowder Fantasy combines elements of Epic Fantasy (Magic, Mythical Creatures, Elves, Epic Scale) with Rifles and Railroads. It is a relatively new subgenre, but has been picking up popularity. It varies from Steampunk in that it stays away from the fantastic inventions (airships, machines, etc.) that are common in Steampunk. It is also sometimes called Muskets & Magic. Gunpowder fantasy is generally set in a world with roughly equivalent technology to the world in the 17th through 19th centuries, particularly the latter eras. Typically, gunpowder fantasy also includes elements of real-world technology such as steam power, telegraphy and in some cases early telephones or combustion engines. For more details on this topic, see Medieval fantasy. Stories set in prehistoric times and depicting the lives of prehistoric people. Poul Anderson has written many novels mixing northern mythology with the historic events of the Viking age: The Broken Sword, Hrolf Kraki's Saga. War of the Gods, and Mother of Kings. More historical with only slight fantasy elements are The Last Viking series. Lynne Ellison's The Green Bronze Mirror about a teenage girl who goes back in time to the Roman Empire and meets a Roman witch and a magic-wielding druid. Hayao Miyazaki's Princess Mononoke about a warrior prince in 14th-century Japan, who travels to the West in order to remove a demon curse from him by a Forest Spirit. James Gawley is a classical scholar who writes Classical Fantasy based on the civil wars of the late Roman Republic. Philip Tolhurst's George and the Dragon mixes Arthurian legend, dragons and World War 2. Robert E. Howard's Hyborian Age includes fantasy versions of many historical countries and peoples. ↑ Shanoes, Veronica (26 January 2012). "20: Historical Fantasy". In Edward James; Farah Mendlesohn. The Cambridge Companion to Fantasy Literature. Cambridge University Press. p. 236. ISBN 978-0-521-42959-7. Retrieved 9 May 2013. ↑ Sinclair Frances, "Historical Fantasy", Riveting Reads plus Fantasy Fiction (UK: School Library Association), 69. 1 2 Sinclair Frances, "Historical Fantasy", Riveting Reads plus Fantasy Fiction, (UK: School Library Association), 69. ↑ Frances Mannsåker, "Elegancy and Wildness:Reflections of the East in the Eighteenth Century Imagination", in George Sebastian Rousseau and Roy Porter, Exoticism in the Enlightenment,Manchester University Press , 1990 ISBN 0-7190-2677-6 (pp. 175-196). ↑ Kenneth Wayne Graham, Vathek and the escape from time: bicentenary revaluations. AMS Press, 1990 (p. 39). 1 2 David Langford, "Deserts",in Westfahl, Gary, ed. The Greenwood Encyclopedia of Science Fiction and Fantasy: Themes, Works, and Wonders. Westport, CT: Greenwood, 2005. ISBN 0-313-32951-6, (pp. 187-189). ↑ John Grant and John Clute, The Encyclopedia of Fantasy, "Hazel, Paul" p 458, ISBN 0-312-19869-8 . Clute comments that the Finnbranch books "operate at a level of originality rare in fantasy". ↑ Paul Harold Kocher, Master of Middle-earth:the fiction of J.R.R. Tolkien Del Rey, 2001, ISBN 0345465601 (p. 18, 167-176). 1 2 3 Stableford, The A to Z of Fantasy Literature ,"Classical Fantasy", pp. 79-80. ↑ John Clute, "Thomas Burnett Swann" in: E.F. Bleiler,.ed. Supernatural Fiction Writers. New York: Scribner's, 1985. pp.1097-1104.